We all know what a pain it can be carrying around bottles of drink, be it to the park, to a party or to a music festival. They’re heavy, they’re bulky and once they’re opened you can’t put them down! So you can imagine our delight when local Leicester company Cell Drinks sent us a bumper pack of their new vodka based drinks for us to take to Glastonbury with us! The drinks are made with triple filtered, 100% distilled grain vodka, and come in 3 flavours; Tropical, Apple and Reverb. With their flexible packaging and a non-spill drinking suction cap, they’re ready to drink, no mess and no spillages, making then completely dance friendly. They’re even endorsed by the Roofie Foundation as offering drink spiking protection. What’s more, not only are they safe, non-messy, practical and lightweight… they taste pretty good too! There’s no chance you’ll be disappointed! Personally the Tropical flavour was my favourite! 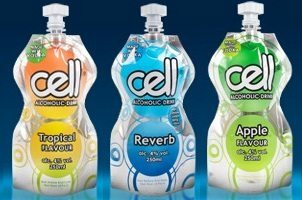 If you’re eager to find out more you can visit the Cell Drinks website HERE and they’ll be at Fanclub on Saturday night selling the drinks to save you queuing at the bar! And now the important bit… those lovely people at Cell Drinks have only gone and given as a box of the drinks to give away to you! You could get your hands on a selection of the drinks to see you through your next music festival by just sending an email to [email protected] with “Cool As Leicester” in the subject line. You’ve got until 5pm on Friday 29th July to get your entries in! You can also add Cell Drinks on Facebook by visiting HERE.